Ella's Kitchen kindly sent us some of their products for our little miss Alesha to test. When they arrived I took them out of the box one by one and handed them to Alesha, she had a good look at each one, I think she knew she had to put her tasting skills to good use! 'Ella is my eleven-year-old daughter and I set up Ella's Kitchen because I passionately believe that she, along with her generation, should have the opportunity to eat better food and also to discover that healthy food can be fun, tasty and cool. We think it's important to always approach things from a child's point of view. 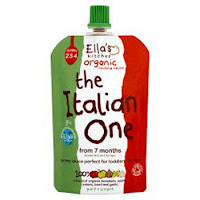 So, we've taken simple, natural ingredients that ooze goodness and created baby foods, and packaging, that should really connect with kids - with flavours, colours, textures and even names that will appeal to all of their senses. 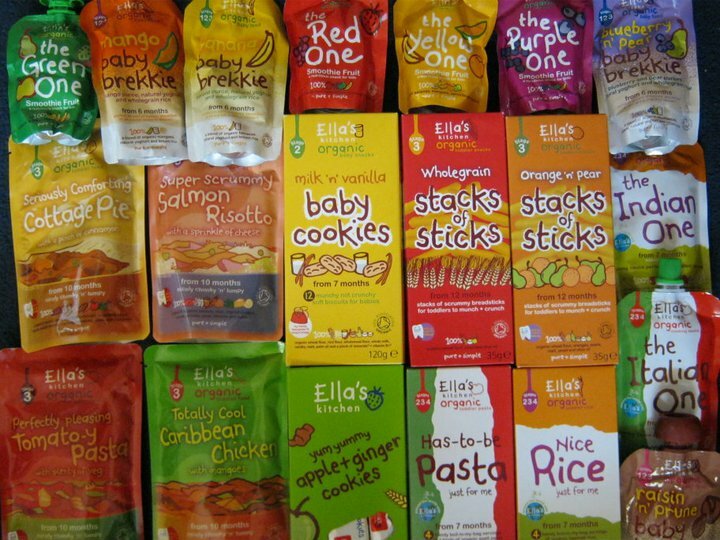 We have eleven ranges at the moment: stage 1 baby food, stage 2 baby food,stage 3 toddler food, stage 1 fruit + baby rice, baby brekkie, baby cookies,stacks of sticks, bakey-bakies, cooking sauces, pasta + rice, smoothie fruits and pack'o'snacks'! These were really handy to take out and about as a little snack, more healthier than the ordinary breadsticks and perfect for little hands to hold. Alesha really enjoyed these, she liked having one in each hand to nibble. Stacks of sticks can be purchased from a wide range of local shops, large supermarkets and even online stores. Sainbury's stock them for 99p a box. They come in two different flavours, orange 'n' pear & wholegrain. On the box it stated,'munchy not crunchy soft biscuits for little people waiting for all their first teeth to properly pop through,! I couldn't agree more with that statement because these cookies were a lifesaver whilst on holiday. Alesha was teething really bad, as you can see from the photos, her cheeks were bright red! When we were out and about it was very hard to keep Alesha happy with the pain from teething. Alesha never really bothered with theeters, instead she would bite like mad on her dolls arms and legs until, we gave her one of these 'special' cookies. It was lovely to see her happy face again, the cookie helped with her discomfort of teething and she also enjoyed it. These cookies are much more healthier than normal cookies, "they don't contain chocolate shh"! Unlike normal cookies these 'special' ones didn't seem to make a mess and they weren't as crunchy. They come in two different flavours, milk 'n' vanilla & apple 'n' ginger. 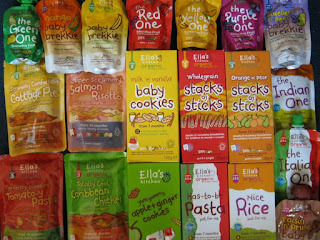 Alesha got sent four meals to try from Ella's Kitchen category, 'stage 3 toddler food'. decided to try her with the 'Salmon Risotto' first, and guess what? It was a clean plate once again! The only meal where she had some leftover over was the 'Tomato-y Pasta'. Once every meal was heated up, they smelt like home cooking, I could of eaten them myself. They really looked as good as they smelt. The portion size was spot on, there wasn't too much or too little. The rice and pasta come in little bags, so very easy to cook, just drop into boiling water for few minutes. I then put the sauce in pan and heated it up for a few minutes. I got two meals from each sauce, as there was too much for one meal so I put thew cap back on and left in fridge till the next day. Both sauces smell like home cooking once mixed with either rice or pasta. Alesha really enjoyed them both. These can be purchased from a wide range of local shops, large supermarkets and even online stores. Boots sell the box of pasta which contains 4 bags at £1.59. I couldn't wait to try Alesha with these because some of them contained fruit in which she has never tasted before, so was looking forward to her reaction. The smoothie pouches are designed for children to 'squeeze and slurp' them, but Alesha hasn't quite got to grips yet and she panic's when too much comes out and decides she doesn't want anymore. So instead with some of the pouches we squeezed them into a bowl and she ate every one no problem. She really did enjoy these. I will for sure be buying them again. The 'baby brekkie's' were different to normal children's breakfast of rice or oats, these contained rice, fruits and yoghurt! Alesha once again enjoyed these but there was one that she wasn't so keen on. The raisin 'n' prune was a totally "no no"! The faces she pulled made me laugh as soon as she tasted it. Not like Alesha to be disliking something so much but there was no way she would touch it. These can be purchased from a wide range of local shops, large supermarkets and even online stores. Kiddicare online stocks the 'baby brekkie' for 97p, whilst Amazon online sells a pack of 12 'smoothie fruits' for £7.69! You can get different types of 'baby brekkie' pouches, banana, mango, raisin 'n' prune and blueberry 'n' pear. The 'smoothie fruits' come in a choice of flavours also, the green one, the purple one, the yellow one and the red one. Overall Ella's Kitchen's organic products got a thumbs up from both me & Alesha, I would also highly recommend! Ella's Kitchen can be found on Facebook and also on Twitter. For more information why not visit their site.